Today, standing in downtown Montreal, one stands on the same ground upon which, more than three hundred years ago, stood a Mohawk village of fifty longhouses, surrounded by cornfields. In 1676, the Mohawk were displaced from their village by European settlers and forced from place to place until they finally landed in a settlement in the middle of their hunting grounds, on the banks of Ottawa Lake. The settlement was called Kanehsatake, and has been inhabited by the Mohawk people up to the current day (Kanehsatake). 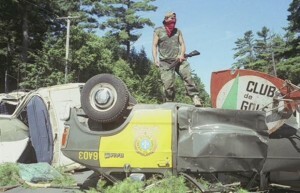 It is the site of what has been called both the ‘Oka Crisis’ and the ‘Indian Summer’ which took place in the summer of 1990, but as illustrated by the acclaimed documentary “Kanehsatake: 270 Years of Resistance” (http://www.youtube.com/watch?v=l8PcYIFtkKQ), has been a site of contention for a much longer period of time than a few months in the summer of 1990. The Mohawk of Kanehsatake were issued by the king of France a written promise that they would retain the nine square miles upon which they were settled in the year 1716 (Kanehsatake). By 1718, however, the king had bequeathed their land to the order of Sulpician Fathers in France without telling the Mohawk that they no longer held the deed to their own land. Supposedly, the Sulpicians were to hold the land in trust for the Mohawk’s exclusive use (Nicholas). When British forces invaded in 1759, the deed was transferred to the Sulpician community in Montreal to assure that they would retain rights to the land (Kanehsatake). Although the British Crown made the Treaty of Oswegatchie with the Mohawk people promising their continued rights to their own land, both the British Government and the Sulpicians began slowly selling off Mohawk lands to private buyers (Nicholas). Many Mohawk chiefs have since worked to have their rights to the land acknowledged. In 1868, Chief Joseph Onasakenrat wrote a petition to the Sulpicians demanding the return of Mohawk land, and then brought a small armed force of Mohawks to the seminary in protest when the demand was ignored. He and his followers were imprisoned (Kanehsatake). In 1936, the Sulpician seminary sold the remaining Mohawk land. In 1961, the neighboring city of Oka built a private, member-only golf course on a portion of the land, ignoring the protests of the Mohawk people (Kanehsatake). Finally, in 1988, the city made plans to expand the golf course, which would destroy the Mohawk’s ancestral burial site and sacred pine grove (Oka). On March 10, a small group of Mohawk people gathered on a dirt road to barricade access to the site. The mayor of Oka declared that if they were not gone by July 9th the police would be called in to take action. The barricade only grew during that time, and subsequently a police raid took place. The raid, however, was executed poorly: tear gas released by the police was blown back at them by the wind, a major shoot out resulted in the death of one police officer, and there was mass confusion on both sides (Kanehsatake). Mohawk warriors from other bands came to join the Mohawks of Kanehsatake, and the Mohawk of nearby Kahnawake set up a barricade on the major Mercier Bridge where is crossed through their land in solidarity with Kanehsatake (Oka). The traffic jam caused by this blockade as well as the anger over the death of a police officer resulted in a mob in the nearby town of Châteauguay burning the strung-up effigy of a Mohawk warrior while chanting “savages.” Peace negotiations were attempted on the neutral ground of the nearby Trappist monastery, but fell apart after seven days over the issues of sovereignty and arrest of the warriors after disengagement (Kanehsatake). On August 20th the army was brought in to take over for the police (Oka). The Mercier Bridge barricade was then given up by the Kahnawake, much to the dismay of the Kanehsatake with whom the government now refused to have any negotiations or to accept anything but unconditional surrender (Kanehsatake). Finally on September 25 the remaining Mohawk warriors surrendered and many were arrested (Oka). The planned development, however, did not take place (Kanehsatake). The confrontation between the Kanehsatake Mohawk and the local and national governments received major attention from the Canadian media, but in all of the resources I came across, the sacredness of the land being disputed was never dealt with. Nowhere did I find an explanation of why the land is sacred, nor is there any evidence that at the time it was acknowledged as an important issue. Instead, the focus was land rights and First Nations sovereignty. This may partially have been because in Western culture our own burial grounds have a certain degree of sacredness, and we certainly would not want someone building a golf course on our own family members’ graves, and so the assumption may have been made that there is nothing else to understand. However, as pointed out by Robert Michaelsen, “Native American religions cannot be easily understood within the framework of common Western notions of religion and its role in society” and thus “accurate descriptions and interpretations are needed to inform public deliberations” (1). When Celinda Kaelin spoke about the importance of Pipe Ceremony with respect to those who have recently passed away, she hinted at the important continued relationship many indigenous peoples have with their deceased. She explained that the living are responsible for helping the spirits of the dead pass smoothly through the spirit world by following certain ceremonies and rites, and that in return the spirits of deceased ancestors often act as guides and spiritual helpers to those still living. Jacqueline Fear-Segal also explains in her article about the treatment of Native American dead in a cemetery in Carlisle, PA, that proper treatment of remains is “fundamental to the well-being of those who are alive today” (3). Her observation that “the dominant society failed to acknowledge that for many Native Americans human remains are remnants of living individuals whose descendants retain a cultural and spiritual relationship to them long after they die” (Fear-Segal 3) seems to also be applicable to the Kanehsatake Mohawk, who were treated as if their protests were merely about land rights and had no spiritual dimension. There is some hope, however, that people are beginning to realize the importance of this dimension and give it the focus it deserves found in the case study of a more recent conflict in Vancouver. In a protest during the spring of 2012 by the Musqueam Indian Band against a condo development on their sacred burial grounds, the spiritual dimension of their objections was brought to the forefront. One woman stated to the press “In our culture, we return to the earth, it’s our ancestors’ final resting place, we don’t want them to be disturbed,” and Grand Chief Phillip Stewart explained “Protecting the sacred burial sites of our ancestors is the most fundamental responsibility that we have to those who have gone before us” (Sarra). Fear-Segal, Jacqueline. “Institutional Death and Ceremonial Healing Far from Home: The Carlisle Indian School Cemetery.” Museum Anthropology 33.2 (n.d.): 157-71. Print. Kanehsatake: 270 Years of Resistance. Prod. Alanis Obomsawin. National Film Board of Canada, 1993. Michaelsen, Robert. “The Significance of the American Indian Religious Freedom Act of 1978.” Journal of the American Academy of Religion (n.d.): 93-115. Print. Nicholas, Sohenrise Paul. Grand Chief of Kanesatake. THE OKA CRISIS IS PART OF HISTORY; THE FUTURE OF KANESATAKE SHALL BE BRIGHTER. Indigenous Peoples Issues and Resources. N.p., 13 July 2010. Web. 02 Nov. 2012. 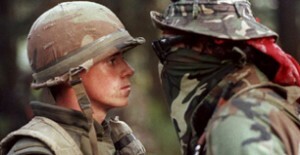 <http://indigenouspeoplesissues.com/index.php?option=com_content&view=article&id=5905:1990-oka-crisis-20th-anniversary-2010-grand-chief-sohenrise-paul-nicholas-states-that-the-oka-crisis-is-part-of-history-the-future-of-kanesatake-shall-be-brighter&catid=22&Itemid=55>. “Oka.” Canada History. N.p., 2012. Web. 02 Nov. 2012. <http://www.canadahistory.com/sections/eras/pcsinpower/oka.htm>. Sarra, Samantah. “Musqueam in Vancouver Defend Sacred Burial Site against Condos.” Rabble.ca: News for the Rest of Us. N.p., 31 May 2012. Web. 16 Nov. 2012. <http://rabble.ca/news/2012/05/musqueam-vancouver-defend-sacred-burial-site-against-condos>.